The Gods walk the Realms. Cast out from their heavenly domain, the gods of the Forgotten Realms wander the land as mortals-extremely powerful mortals, to be certain, but mortal nonetheless. They seek the lost Tablets of Fate, key to their return. But as the good and evil gods for the Realms bring... This Forgotten Realms campaign adventure is designed for characters of levels 9-13. It can be played as a stand-alone adventure or as the second adventure in a three-part series. Each encounter contains tactical information for the Dungeon Master and expanded map features for ease of play. Shadowdale: The Scouring of the Land by Richard Baker 3.5 Edition Shining South (Dungeon & Dragons d20 3.5 Fantasy Roleplaying, Forgotten Realms Supplement) by Thomas M. Reid... 8/08/2007�� Shadowdale: The Weave Unwinding is an adventure designed for characters levels 8-13 and is the second part of a three-part series set in the Forgotten Realms, although it can easily be played as a stand-alone adventure. In addition to encounters, this book contains detailed source material on the town of Shadowdale and it's environs. 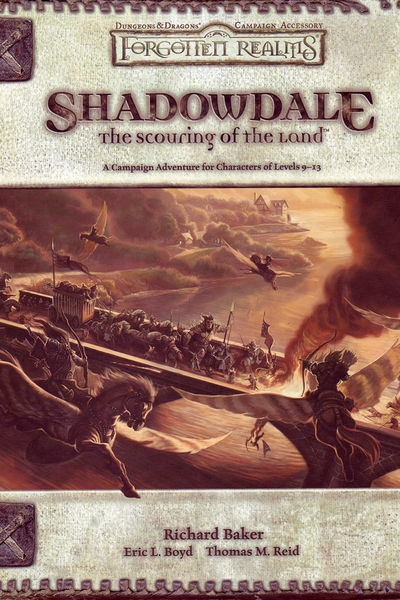 Shadowdale: The Scouring of the Land (2007) is a Forgotten Realms adventure for 3.5e D&D that advances four PCs from 9th to 12th level. This is the second adventure in a series that began with Cormyr: The Tearing of the Weave, but can be easily played as a stand-alone adventure. 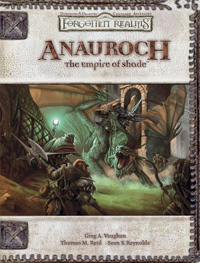 25/10/2006�� Shadowdale: The Scouring of the Land A Forgotten Realms Supplement Richard Baker, Eric L. Boyd, Thomas M. Reid Elminster�s tower lies in ruins, and the town of Shadowdale has been conquered by evil Sharrans and the nefarious forces of Zhentil Keep.